Listed almost 2 years ago by RETROVERB MUSIC, INC.
*Note: I am not a dealer. I am a private guitar collector and this instrument is from my personal collection of 1500+ custom and vintage guitars and amplifiers. 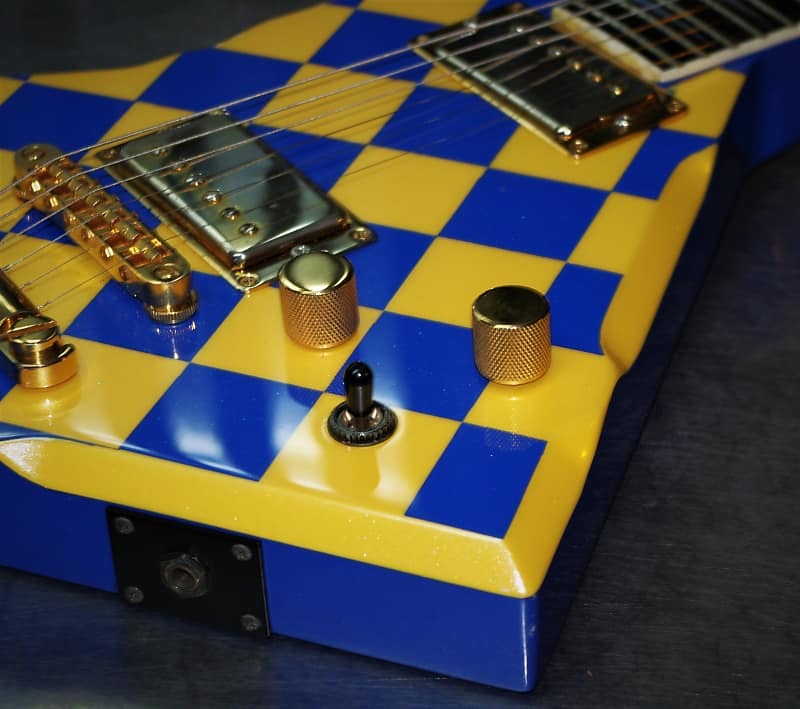 One of my favorite American guitar builders is Dave Wintz, aka, Robin Guitars, out of Houston, TX. 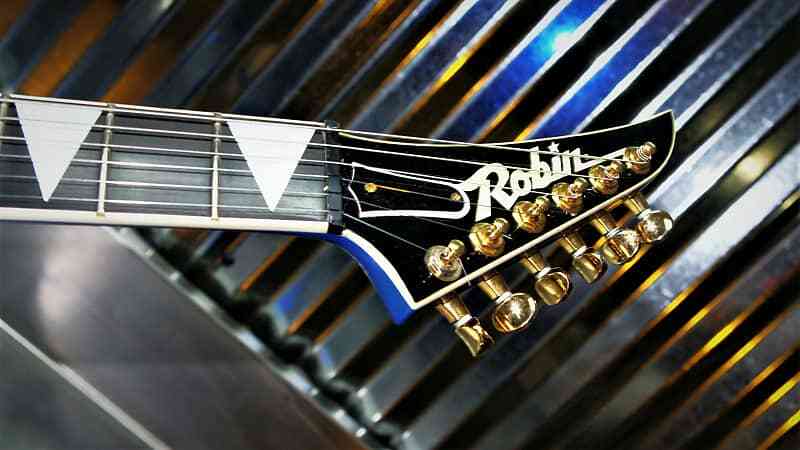 Dave started out in the guitar business in 1972 in partnership with Bart Wittrock in “Rockin’Robin Guitars and Music in Houston, a store selling vintage guitars. They quickly migrated to importing MIJ “copy” guitars and putting their label on them. 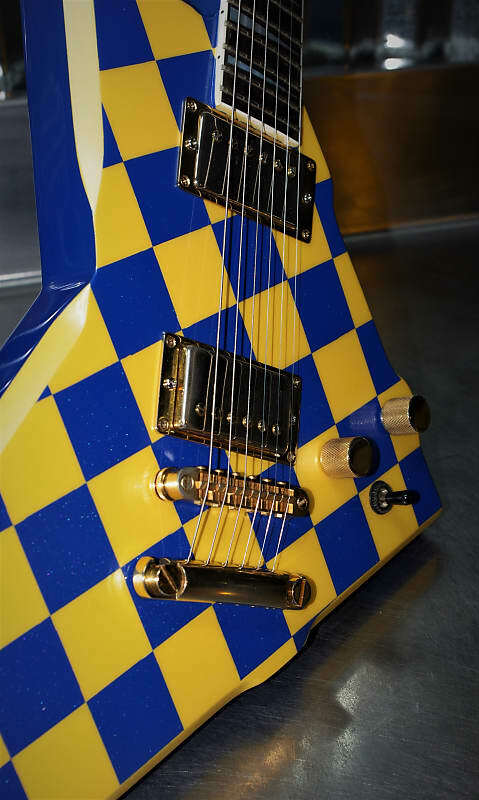 In 1982, Dave started designing his own unique style of guitars and having them built in Japan. 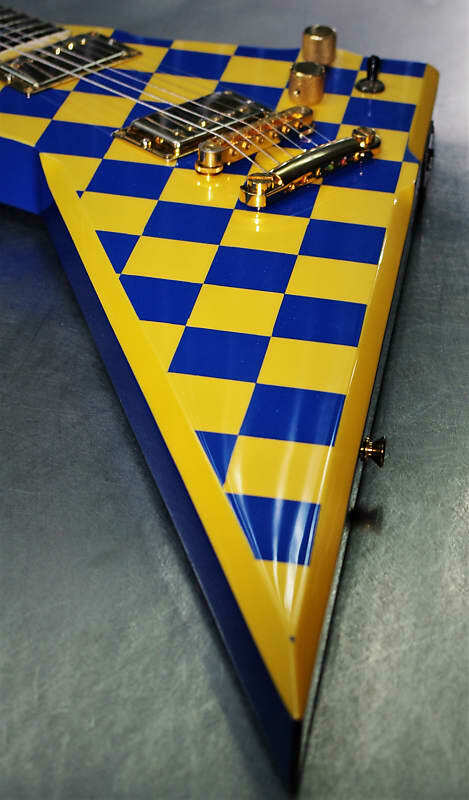 The Wedge was one of Dave’s new “exciting” designs in 1985. 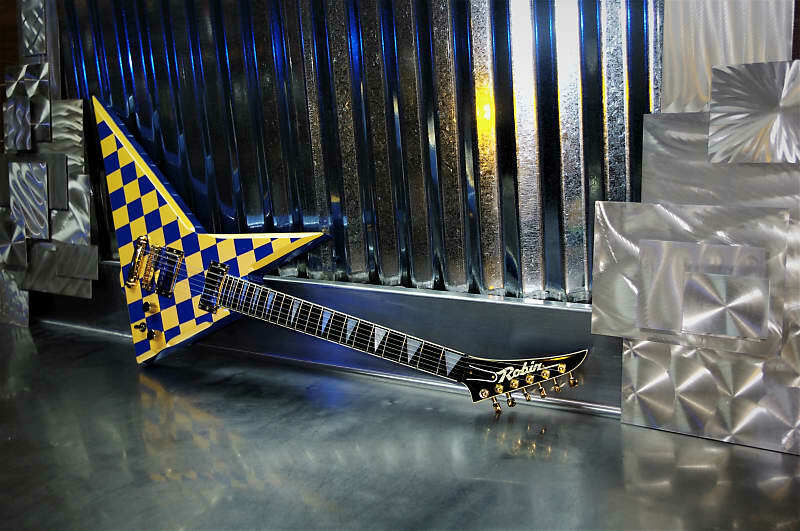 His goal was to break out of the mainstream with a guitar that was totally different and “stunning”. Getting attention was, and continues to be, the lifeblood of small guitar builders throughout the world. And yes, he was right on target. 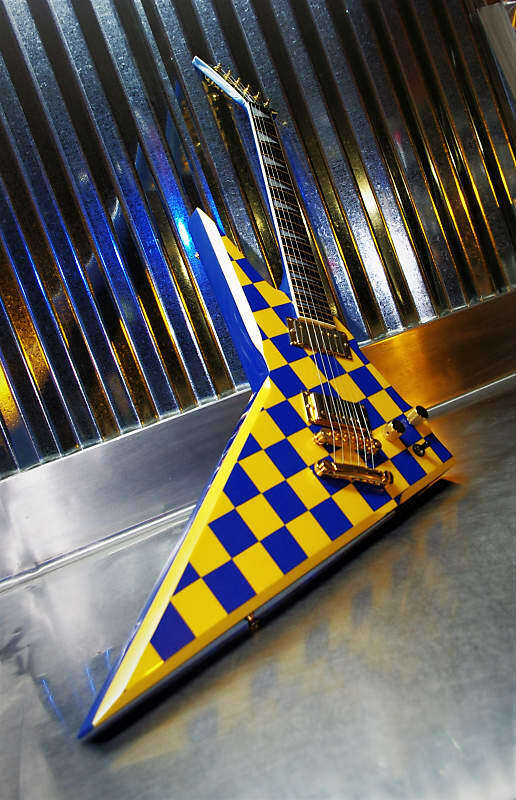 The “Wedge” was a take on the different designs, mostly Gibson, that were already becoming “legends” like the “Flying V”, “Explorer”, etc. But, the “Wedge” was its own design. It is really a wide triangle of wood with a neck added to one side. Wedges were made in Japan until 1986 when economic changes, i.e., currency exchange rates, came to favor Japan and to cost Robin more USD. 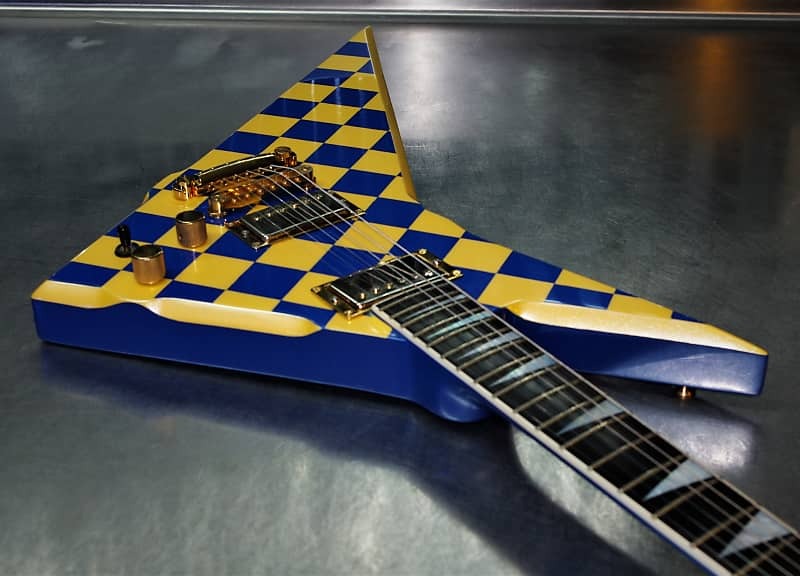 Bart departed the manufacturing side of the business and went back to the “Rockin’ Robin” store to sell vintage guitars while Dave started building guitars in Houston, TX-in the USA. 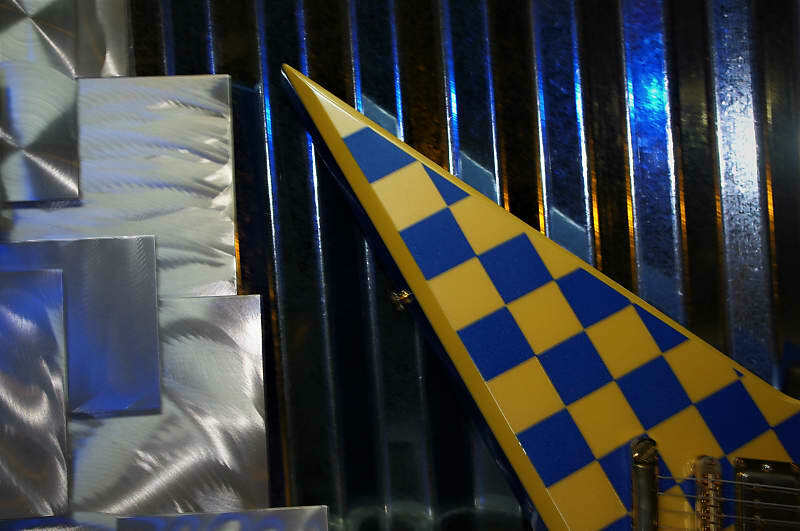 The Wedge was among those designs that Dave started building in Houston. 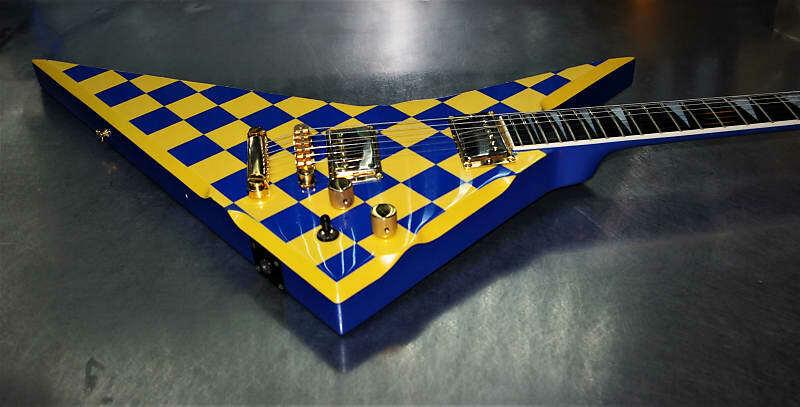 But as happens most times, excitement over a drastically different guitar, i.e., a real “oddity”, fades quickly. So, it was with the “Wedge”. 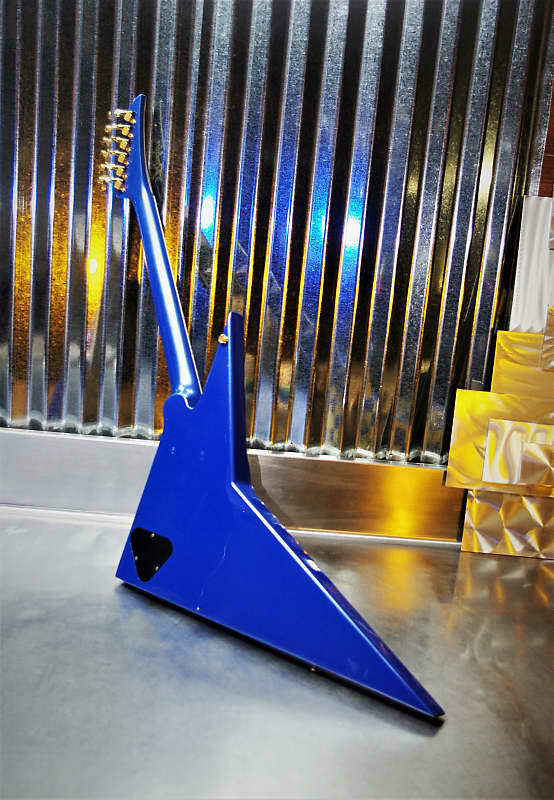 Production stopped on the “Wedge” in 1988 after about 200 were sold but very few of them were Made in the USA”. 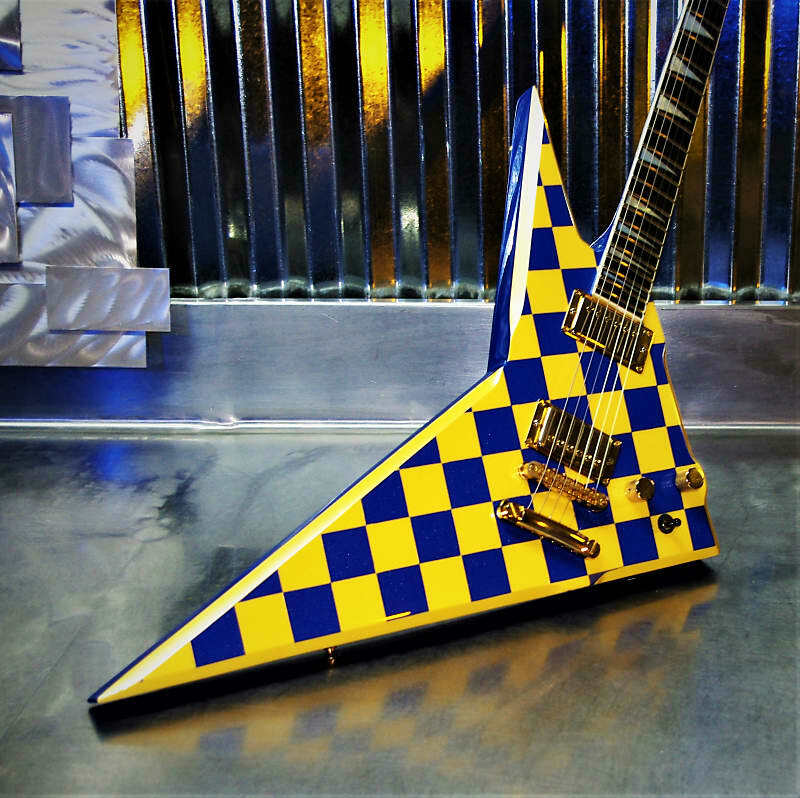 “The guitar with a checkered future”. As best I can tell, and was told by the original owner, mine was built by Dave in late 1987. It is the “Custom” set neck model. PICKUPS: The pickups in this guitar may have been updates. I can’t tell. As you can see from the photos, there is a “Rio Grande 2001 BBQ” in the bridge position and another Rio Grande 2001 in the neck position but paint has covered its model name. But it does not sound like the BBQ so most likely it is a different one. 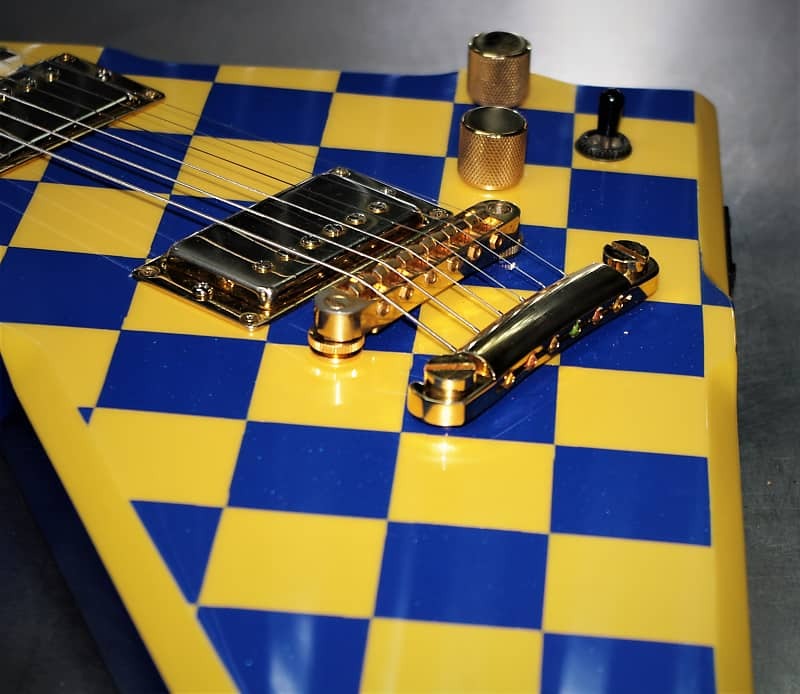 FINISH: This is the special feature of this guitar. It came to me in white which was just not complimentary I thought to its “exciting style” so I asked Stike at Rowyco Kustoms to come up with a finish that would “liberate” the true inner self of this guitar. 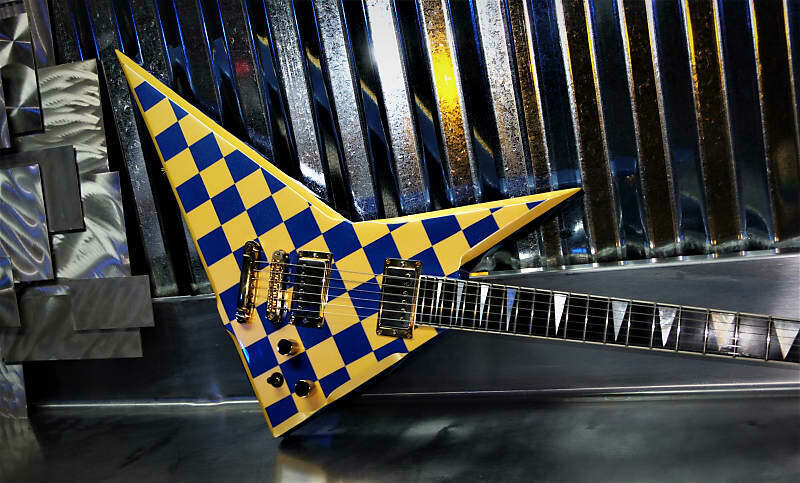 And he delivered in deuces with this checkboard yellow and aquamarine blue metallic finish. 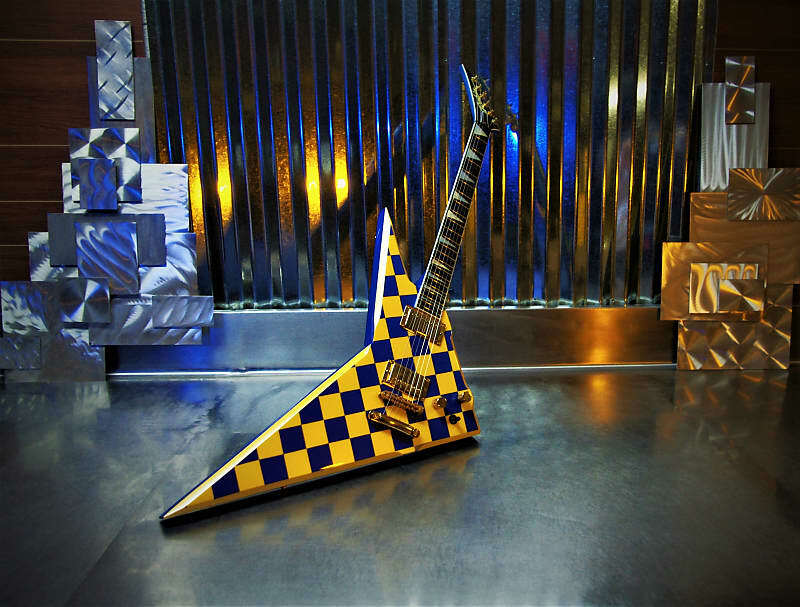 It is now the ultimate stage guitar. CASE: Not original. It is a Dean case modified to fit the Wedge perfectly. 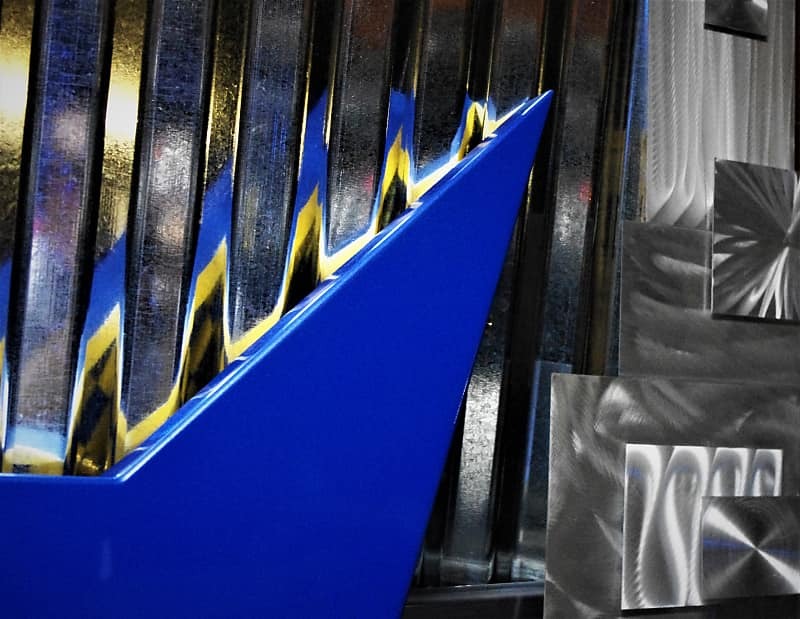 What is also interesting about the “Wedge” is that the top sides are not square but are contoured giving it a multi-dimensional feel and appearance. Now, how does it play since it is so odd? Great. Well balanced and comfortable but needs to be hung tightly to your body to avoid it falling onto your foot and implanting itself there. 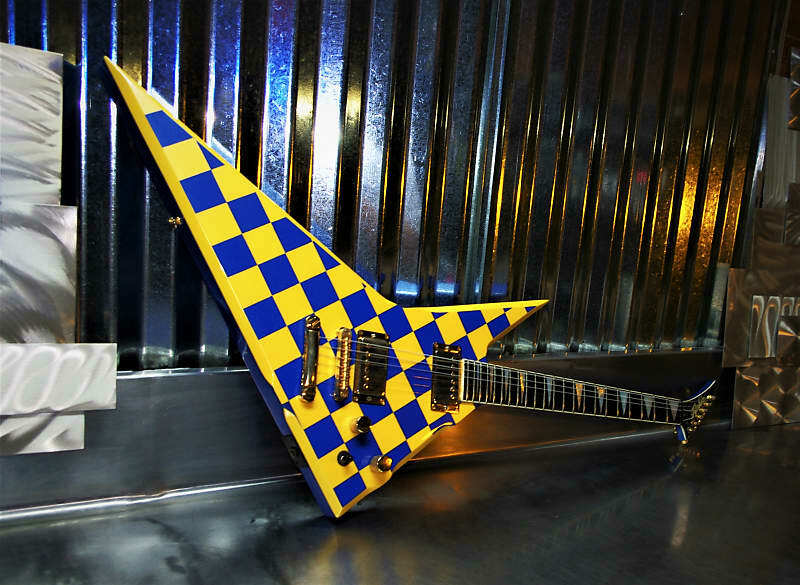 You really must be a cool player or collector to own this guitar. It is not one for the shy because it will get attention every time you pull it out of its case. 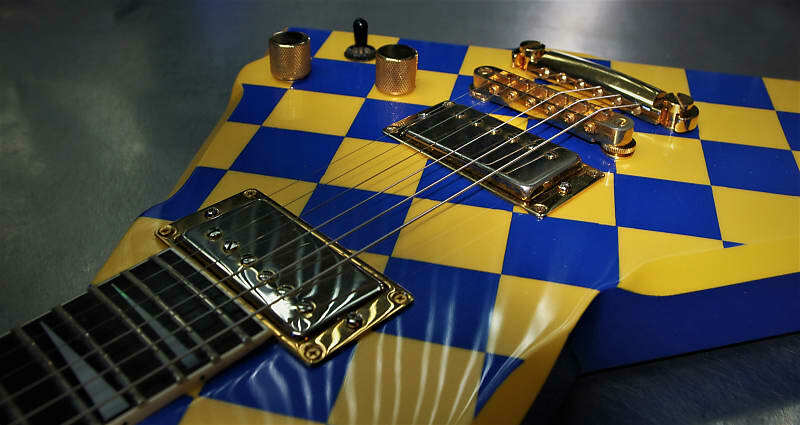 I say it is a “A guitar with a checkered future”. 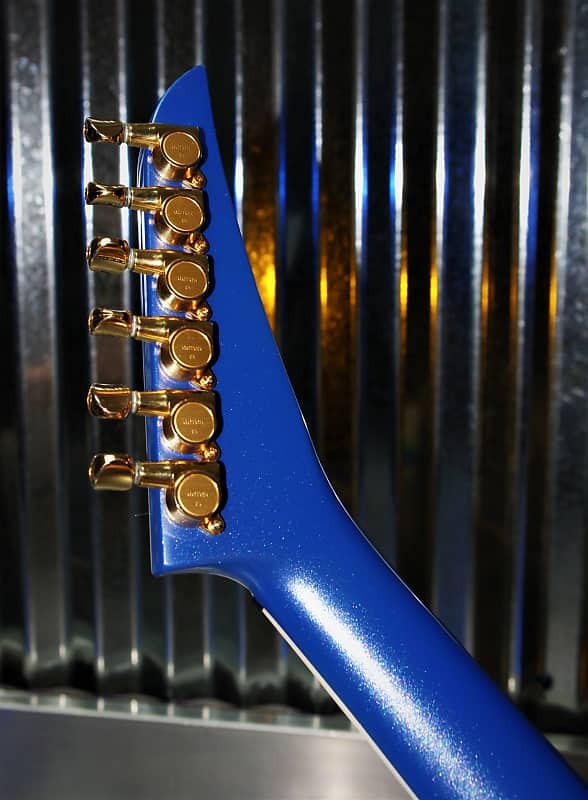 Guitar is guaranteed to be in EXCELLENT OPERATING AND COSMETIC CONDITION. OVERALL CONDITION: EXCELLENT. Please look at the photos here to satisfy yourself about it condition. This guitar has just been refinished by “Stike” of ROWYCO Custom finishes and it is unbelievable If you need more information, please contact me. I. MY TRY IT OUT POLICY. If your guitar arrives damaged, please let me know immediately by email. Be sure to hold onto all packing material and the box. I will contact the shipper for an inspection. Remember that this can take up to a couple of weeks but I will rush it along. PAYMENT DUE WITHIN 24 HOURS OF PURCHASE. 1. I will ship to any location but require that buyers outside of the continental USA contact me for a shipping estimate before buying one of my guitars. a. Import duties, taxes, and charges are not included in the item price or shipping cost. These charges are the buyer's responsibility. That means you pay them. Please check with your country's customs office to determine what these additional costs will be prior to bidding or buying. b. I hold a license to export vintage guitars than may contain internationally protected wood species under CITES so no worry for you as an international buyer. Do not risk losing your purchase from sellers who do not hold this license. 2. 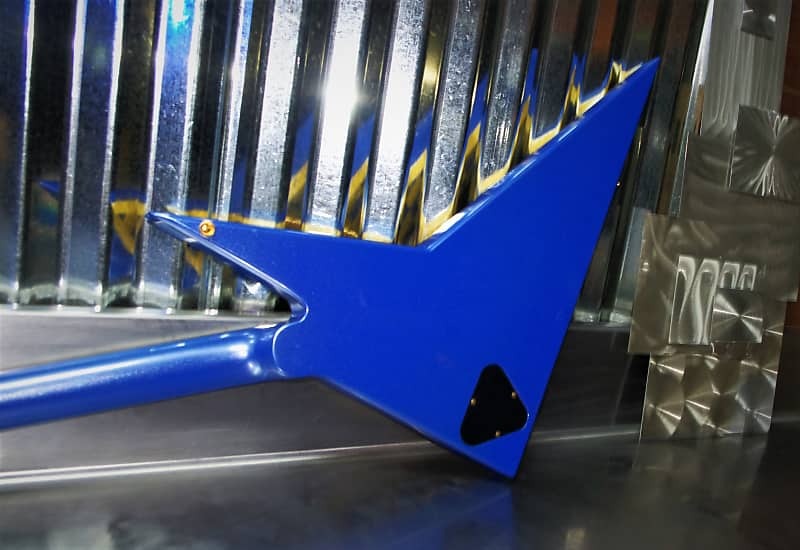 Returns of undamaged and unmodified instruments may be allowed, with permission of Seller, for a period of up to 14 days following delivering but will be subject to a 20% restocking fee. Items must be returned in original, as-shipped condition with all original packaging and no signs of use. Buyer assumes responsibility for all return shipping costs. 1. The guitar is in the cosmetic condition as described in this ad. 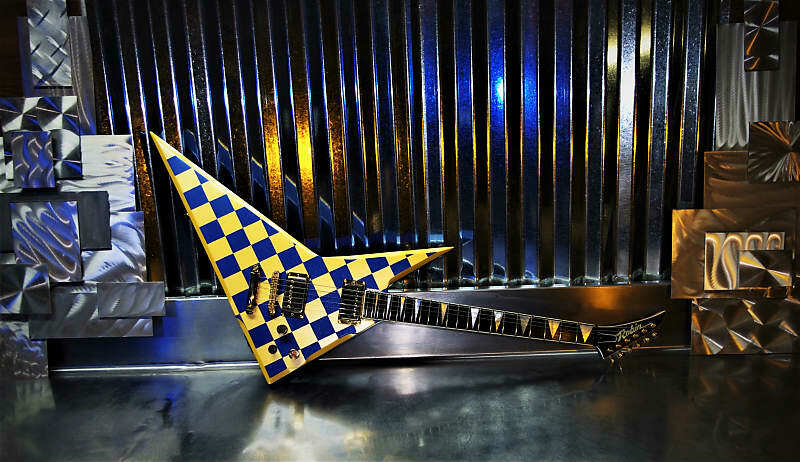 Used guitars will all have signs of use to include dings, dents, scratches, smudges, etc. Please look at photos closely. Guarantee does not cover consumables, e.g., batteries(all guitars ship without batteries), strings, etc. Based on purchase price of $3,995 at 10% APR for 12 months. Excludes tax and shipping fees, to be calculated at checkout. Rates range from 10-30% APR. Choose from 3, 6, or 12 monthly payments.